THE LEVANT NEWS EXCLUSIVE – By Dr. Haytham Mouzahem* — On 21 April 2016, China’s Special Envoy on Syrian crisis Chai Cho Yan visited Damascus and met with the Syrian Minister of Foreign Affairs Walid al-Moallem, and the head of the Syrian government’s delegation to the Geneva talks, Bashar al-Jaafari. For his part, the Chinese envoy stressed the importance of follow-up coordination, especially in the field of combating terrorism, noting the role of the Syrian government and its cooperation with regard to the Uighur terrorists who are in the ranks of terrorist groups in Syria. It is worth mentioning that this envoy has been appointed to this position the end of March – March 2016. There is no doubt that the presence of Uighur “Jihadis” in Syria, is worrying the Chinese government, and is the first reason that pushed them to appoint a special envoy to Syria, and increased China’s interest in a peaceful solution to the Syrian crisis that may return security and stability of the country. A number of media reports have confirmed the existence of thousands of Chinese Uighur fighters in Syria, fighting with al-Nusra front (Jabhat al-Nusra), Ahrar Al-sham and ISIS. The fighters are of the Muslim Uighur minority from Xinjiang province in Western China and they belong to “The Turkistan Islamic Party”, also known as the East Turkistan Islamic Movement (ETIM). Muslim Uighur used to call Xinjiang province as “East Turkestan” before its occupation by China in 1949. In April 2016, Syrian Prime Minister Wael Nader al-Halqi revealed that more than 5,000 Jihadis travelled through Turkey on their way to Idlib and the outskirts of Aleppo. Asia News reported on April 22, that a large number of “Jihadi” fighters from the “The Turkistan Islamic Party”(TIP), have been deployed in the village of Al Bawabiya (southwest of Aleppo), and they received weapons and ammunition from the “al Nusra Front” and “Jund al-Aqsa” groups. According to al Arabiya English correspondent, Mohanad Hage Ali, there are a few thousand Uighur fighters, and many of them arrived with their families from China. They are based in Idlib province, northern Syria, as well as in Lattakia countryside, while other sources said there are Uighur fighters in Manbaj town and Riqqa province with ISIS. The Uighur have been seen in large numbers in many regions of Idlib, including the strategic town of Jisr al-Shughour, Ariha, and the highlands of Jabal al-Zawiya. The Uighur have settled with their families in deserted Alawite towns in Jisr al-Shughour. 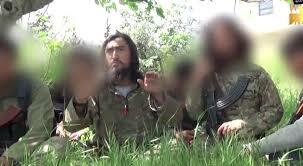 Most of the Uighur fighters, belong to the Turkistan Islamic Party (TIP). Which is allied with the Al-Nusra Front, the Syrian branch of Al-Qaeda. 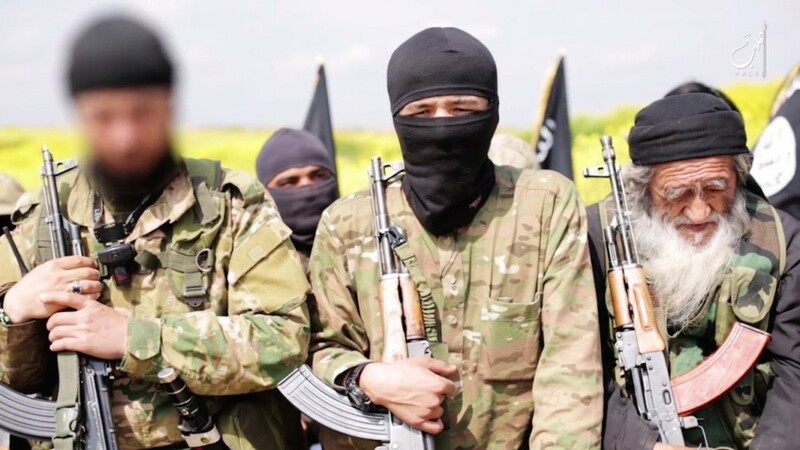 Sources estimate at least 2000 – 2500 Uighur fighters are in North Syria with TIP, while there are about 500 to 1000 of them with ISIS, under “ Wilayat Khurasan”, a broad region including parts of Afghanistan and Pakistan that ISIS has claimed as its own province. According to Al-Mayadden TV channel, There are nearly 4000- 5000 Uighur citizens(men and women) who live in Jabal al-Turkman in Latakia province and in Zunbaki village near Jisr al-Shughour in Idlib province. Those families have been settled there under the supervision of the Turkish intelligence in an attempt to change the demographic nature of the area and augment the Turkish race there. Uighur militants that good ties with Nusra Front, Al Qaeda branch in Syria, a continuation of their historical ties with al-Qaeda, and their allegiance to the Taliban movement and its founder and late leader, Mullah Omar. TIP fighters have played a crucial role in “Jaysh al-Fateh” (Army of Conquest) gains in Idlib province in 2015, especially in Jisr-Ashughour and AbuZuhur airport battles. They also released videos that show them fighting in al-Ghab plains in Hama’s western countryside, and in Jib Al-Ahmar in Latakia Province. 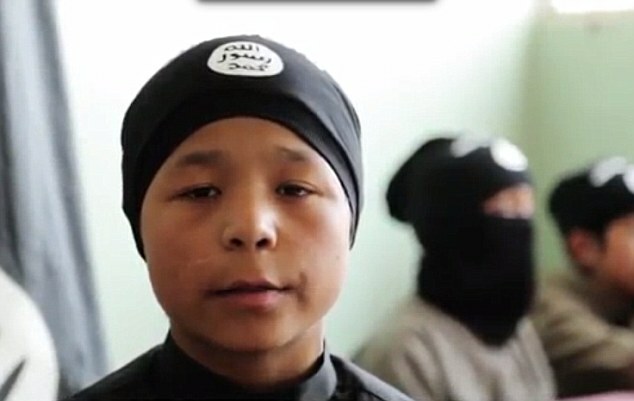 Although, there are hundred of Uighur fighters with ISIS in Syria(Riqqa province and Manbaj) and Iraq, but Hage Ali report said that TIP have strained relations with ISIS, due to the clashes between ISIS and Nusra (Al Qaeda) in Syria as well as the tensions between ISIS and the Taliban in Afghanistan, because of their allegiance(bay’aa) to Taliban’s leader and they consider him the true Caliph. The Videos released by the Turkistan Islamic Party (TIP) show the Uighur leaders and militants are fighting alongside al-Nusra front and Uzbek brigades. In these videos, the Uighur have praised attacks in China, and Chinese authorities believe that those “Jihadis” seek to gain independence for Xinjiang and create their Islamic state there or as an extension of the Islamic Caliphate of Taliban or ISIS. Some analysts believe if the TIP continues to gain power within the “Army of Conquest” that is an umbrella of various al Qaeda affiliates and salafist Jihadis, Xinjiang may become the next Afghanistan and follow the pattern of Syria and Iraq, with local militant forces/cross border havens attracting foreign fighters, and enjoying material and diplomatic support from Turkey and other outside powers with shared ideology/interests. The TIP fighters have played a crucial role in AbuZuhur airport battle in September 2015 when “the Fateh Army”(the Army of Conquest), that includes Nusra Front and “Ahrar –Asham” and other Salafi groups, managed to control the airport base in Idlib province. The most prominent TIP fighter in the Jisr al Shughur videos was the spokesman for TIP’s “Syria branch” since 2014, Abu Ridha al-Turkistani. In the videos he led fighters to take over a building, and planted a flag on which “Turkistan Islamic Party” was written in Arabic. It is worth noting that Turkey supports this “Army of Conquest”. The numbers of Uighur fighters were about 700 in this battle only, and that indicates that their numbers in North Syria has been increased last year. They lost nearly 300 killed in the battles of Gap plain, Idlib and Latakia provinces. Turkish media sources revealed that Uighur fighters have got weapons and technical supplies, from the Turkish intelligence. Dr. Christina Lin, a Fellow at the Center for Transatlantic Relations at SAIS-Johns Hopkins University, wrote in a study, that Chinese Uighur fighters are backed by Turkey and are gaining a stronghold in Syria from which to launch attacks on China. Lin relied on al-Mayadeen TV report that 3,500 Uighurs are settling in a in Zunbaki village near Jisr-al Shugour, close to the stronghold of Turkistan Islamic Party (TIP) that is a part of “Jaysh al-Fateh” (Army of Conquest). She added that they are allegedly under the supervision of Turkish intelligence that has been accused of supplying fake passports to recruit Chinese Uighurs to wage jihad in Syria. Lin believes that through Turkey’s support for the “Army of Conquest”, TIP has risen to prominence within the “Jihadis” coalition and played a key role in defeating the Syrian army at Jisr al Shughour. It is worth noting that Uighur “Jihadis” have claimed a series of terrorists attacks in China in 2013 and 2014, with some Uighurs calling for a revolt against the Chinese communist regime to get their independence from China. Syrian sources said that the Syrian government had informed the Chinese government about those fighters and their role, and urged China to play a role in fighting them and supporting the Syrian army. Chinese analysts believe that the Turkish President Recep Tayyip Erdogan is using the Uighur “Jihadis” to wage a proxy war on China, to achieve his ambitions to reconstitute the “Turkic world from the Adriatic Sea to the Great Wall” of China. analysts pointed to China’s non-interference principle as an impasse to action. Although, China will not tolerate to protect its national security and for that reason the Chinese parliament passed in December 2015 a new anti-terrorism law that allows the military to venture overseas on counter-terror operations. Chinese officials justified the law that their country faces a growing threat from militants and separatists, especially in Xinjiang. However, I believe that China would not intervene militarily as the Russians did, but they may support the Syrian army with some developed weapons and more political support in the UN Security Council and other international organizations. China is a very cautious to not take a side in the regional war, it does not want to upset Saudi Arabia and other Gulf states to preserve its investments and interests there from one side, and it fears its intervention in Syria would lead to escalate the tension with Muslims in Xinjiang province on the other side. *Dr. Haytham Mouzahem is the head of Beirut Center For Middle East Studies, and the Editor in Chief of The Levant News website.